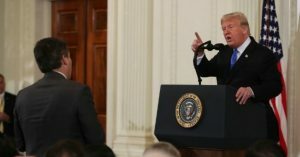 Mayhem broke out at President Donald Trump’s first press conference following the midterm elections as he went into tantrum mode. Mayhem broke out at President Donald Trump’s first press conference following the midterm elections on Wednesday when Trump berated CNN reporter Jim Acosta as a “rude, terrible person” for asking a question about the Russia probe. “You are the enemy of the people,” the president added. Originally published by Common Dreams under the terms of a Creative Commons Attribution-Share Alike 3.0 license.